Q: Which methods have been the most effective at testing your value proposition? Select up to three responses. Is the landing page where you really test value propositions? “I guess I’m easy to surprise. To have an inbound marketing tactic be the most popular way to test value propositions is surprising, to say the least,” remarked Prugh Roeser, founder, LeadLogix. Interesting response by Prugh. 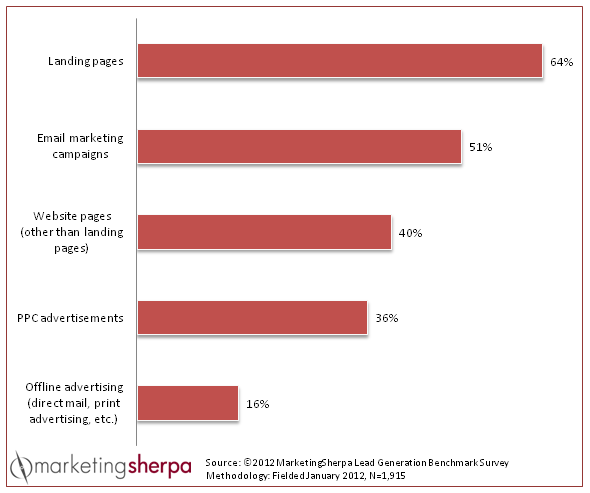 While landing page optimization is one of the tactics we report on in the MarketingSherpa Inbound Marketing Newsletter, I had never thought of landing pages themselves as being specifically inbound. While an SEO landing page is an inbound tactic, a landing page receives traffic from, for example, pay-per-click ads, and I would consider that an outbound-focused funnel. Prugh’s focus is also on what gets prospective customers to the landing page, as opposed to the landing pages themselves, “To us, success in testing value props translates into identifying which version attracts the greater number of the right kinds of customers. If landing page responses are used, an outreach vehicle has to trigger them. And each outreach vehicle embeds a value proposition of one kind or another simply in order to present the product/service. Excellent point, Prugh. He sheds some light on the true complexity of value proposition testing, and his insights bring up a great question for every marketer who considers testing value props on landing pages. Is the landing page actually where you’re testing the value proposition? Or is it just catching conversions from an outbound channel like pay-per-click advertising? I suspect, it’s really a combination of the two. You’re testing your core value proposition as your ideal customer travels through the entire funnel. Plus, in this case, the PPC ad and the landing page (or whatever steps your funnel might have) are all expressions of the core value prop with their own derivative value propositions. Stage #1: Identify points of value – Live interviews with customers and sales reps can inform this stage. Stage #2: Test points of value within channels – Such as PPC ads or email. Stage #3: Test the top points of value on landing pages – This moves beyond interest metrics (such as open rate and clickthrough rate) to deeper funnel metrics like conversion rate, revenue generated, and leads captured.